Everyone knows the classic Beef Wellington, so, so, perfect for special occasions and is a showstopper on the dinner table. This recipe for a classic Wellington comes from renowned chef Jeff Baker at Farmisons & Co Online Butcher and Heritage Meats near Ripon. Though this recipe says for two, it’ll do just fine for a table of four, with small appetites, says Jeff. I have swapped out the dry aged beef for a piece of venison which is a beautiful, lean, tasty meat and works so, so well in this recipe. The cut of meat is a loin fillet which is off the bone and to make sure it is an even piece to use for the Wellington, is cut from the centre of the loin. Soften the shallots and garlic in 10g butter over a gentle heat. Add the mushrooms, raise the heat and cook until all the moisture has gone. Add the sherry and cook until dry once more. Add the chopped tarragon and set to one side to cool. Sear the venison in a very hot frying pan, seasoning with salt and pepper until a rich colour has formed. Add the remaining butter and baste the foaming butter over the meat for 3 to 4 minutes. Remove from pan and chill until the fillet is cold. Roll out the pastry to an oblong approximately 30 cm square and 5mm thick, making sure the pastry will wrap around both the meat and the duxelle. Position the beef two-thirds of the way up the duxelle. Brush the edges of pastry with the egg and milk mix. Gently indent into the sealed edge a table fork creating a secure seal. Trim the excess pastry away 10 mm from the fold. Carefully score the pastry top with a sharp knife, making sure you don’t go through the pastry and expose the filling. Brush with the egg and milk mix, place onto a baking tray lined with parchment paper and bake in a pre-heated oven, 185C fan for approximately 30 minutes, the pastry should be golden brown and brittle when cooked. 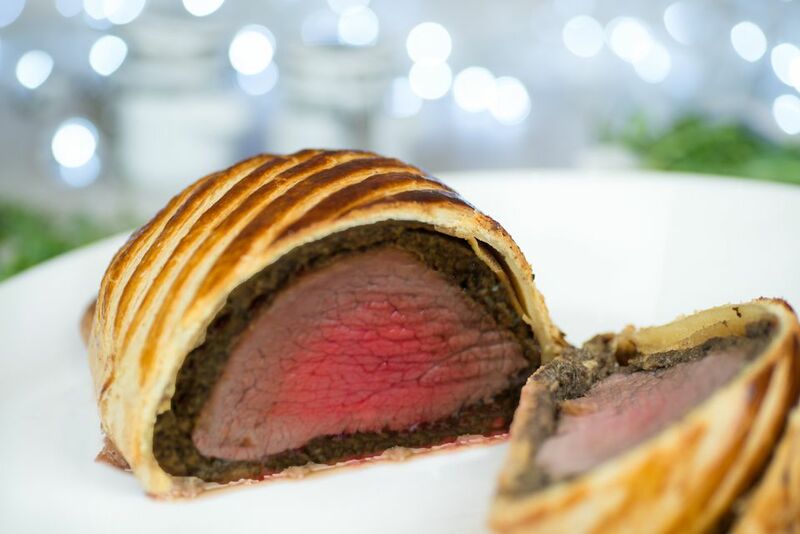 Using a meat thermometer, check the temperature of the beef which should be 54C after resting for 10 minutes, remove the Wellington from the oven at 50C if you want a pink beef wellington.